iCoinProSuccess, exclusively made available at iCoinProSuccess.com, is one of the latest Bitcoin pyramid schemes to enter the cryptocurrency domain. The assertion that their operation to be the first definitive source for everything Bitcoin and cryptocurrency related is a flat out joke. Allegedly, the main focus of this site would be to enlighten potential investors on the opportunities of bitcoins through their educational program, but unfortunately that is not their main priority. Simple research and deductions will enable you to arrive to the conclusion that the main agenda pushed by iCoinProSuccess would be to sucker as many people as possible into their pyramid scheme business model. Naturally, as most of you know, pyramid schemes are not only unstable, but illegal business models, which makes working with iCoinProSuccess more dangerous than traditional Bitcoin opportunities. The iCoinProSuccess site was designed with the blatant intentions to restrict the viewers ability to learn more about their operation. No contact us, about us, terms of conditions or FAQ pages are found on the site, which leaves viewers with only a promotional video to learn about this Bitcoin operation. The only way of communicating with their site would be through their email address, [email protected], which isn’t made available until after you sign up with their program. The pitch video found on the site is quite elementary and does little to accurately depict the business model enacted by this Bitcoin operation. Now, if you took the time to watch the video, you will notice how the first couple of minutes are dedicated to educate investors on how much Bitcoin has increased in value since their inception early on and how within the next few years it will allegedly reach monumental heights such as $1 million per Bitcoin. Sounds a little bit preposterous, right? Further into the promotional video the narrator goes on to explain how it is mathematically possible to describe how on November 18th, 2017, the price of Bitcoin is likely to soar even higher. Not only is this statement an outright lie, but there is no way to 100% accurately predict the future direction of any investable asset, otherwise we’d all be millionaires by now. It is just not plausible and the sheer fact that the creators behind this site included such a misleading statement in their video script goes to show how ignorant these con-artists truly are. Besides relying upon their elementary promotional video to lure you in, iCoinProSuccess relies heavily upon email marketing to convince potential investors to get started with their program. As you can gather from the image above, iCoinProSuccess representatives will do just about anything in order to entice you into signing up with their program so that they can generate more income off of your deception. As you will learn about half way through the promotional video, iCoinPro claims there their main focus would be to educate investors about the basics of Bitcoin and cryptocurrencies and how you get started for $39.95/month. After you commit with their service you will allegedly receive access to over $10,000 worth of training and tools that you won’t be eligible to find anywhere else. Now, when there is only about 1 minute left to the promotional video, we come to the main goal of this site which is where the pyramid scheme comes out. Apart from being able to learn through their program, investors are also able to receive reoccurring monthly payments for each successful person they get to sign up beneath them. 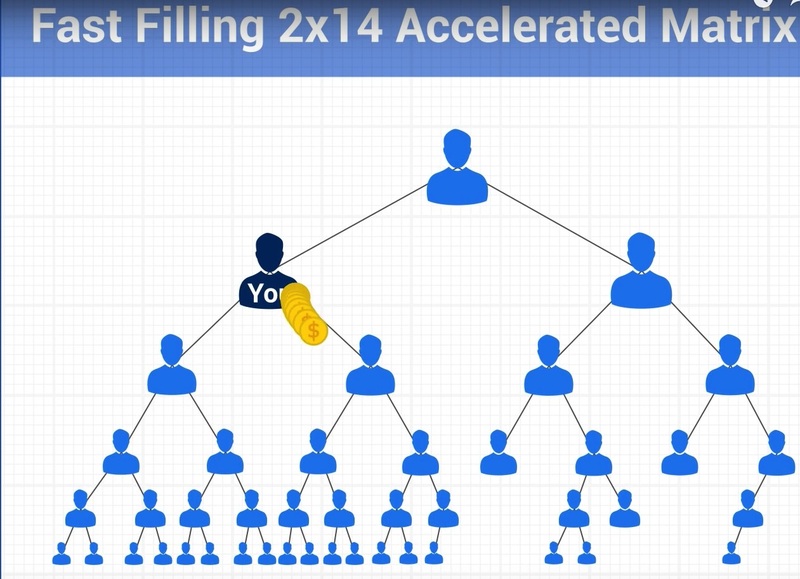 As you can see in the image provided below, which we took from directly from their promotional video, their Fast Filling 2×14 Accelerated Matrix is nothing more than a pyramid scheme base. Investors who convince others to commit with the iCoinPro program will receive monthly payment percentages for each qualifying member beneath them. Not only is this a completely unsustainable business model, but it is highly frowned upon and illegal in some jurisdictions. It is quite evident that iCoinProSuccess is nothing more than a pyramid scheme targeted toward Bitcoin and cryptocurrency investors. Designed more with the affiliate in mind, we sincerely discourage any investor to commit with such a program. Review Verdict: iCoinProSuccess is a Pyramid Scheme and a SCAM! iCoinProSuccess.com had a SimilarWeb global rank of 1,831,474 on November 13, 2017, when this review was posted. Most of its traffic seems to originate in Germany. Do you have any knowledge or experience to share about iCoinProSuccess? Please share your feedback by leaving a comment below! To learn about legitimate cryptocurrency solutions to invest with we encourage you to visit our Cryptocurrency Day Trading Center or our How to Make Money with Bitcoin Guide!